Membership! First of all, you actually get to declaim loudly and most proudly that you are an official member of the AHWA, and are able to quote your member unique AHWA number upon request. Website and Facebook access. The members-only FaceBook group is where most internal communication happens these days. There is still some content and forums on the AHWA website, which are password protected and only accessible by members of the AHWA, including your own member page. This also includes all archived material. AHWA Competition Entry. Paid up members of the AHWA will be able to enter AHWA Flash & Short Story competitions at a reduced cost. This competition will still be open to non-members but they will need to pay the full entry fee. We will also be running other smaller, fun competitions with special give-aways from time to time (ie, movie passes, books), which will be exclusive to AHWA members. Promotional Opportunities. 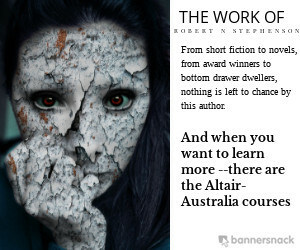 Members of the AHWA can promote their work on Sinister Reads for free. Members are able to apply for the AHWA mentorship program for a fee. Members will be eligible to apply for the critique group to have work critiqued, for a fee. The Australian Horror Writers Association (AHWA) is a non-profit organisation that formed as a way of providing a unified voice and a sense of community for Australian (and NZ) writers of horror/dark fiction, while furthering the development and evolution of this genre within Australia. AHWA aims to become the focal point and first point of reference for Australasian writers and fans of the dark side of literature, and to improve the acceptance and understanding of what horror is to a wider audience. So if this sounds like something you want to be involved with, then membership is for you. You don’t need to live in Australia (or NZ) to apply, but you do need to be an Australasian citizen or permanent resident. Membership applications can be made by filling in and submitting the form below, or by printing or copying the form, filling it in, and then scanning and/or emailing the completed copy to: mailto:members@ustralianhorror.com Then simply pay the $15 joining fee and $20 annual fee by using Paypal. Comments, preferred name, preferred (or existing) login or member number, etc. Contact us at members@australianhorror.com if you have any questions.